Here's how to convert FLV to HEVC (H.265) efficiently on Mac and Windows for hassle-free playback or editing etc. Issue: "Adobe Premier Pro CC does not support importing FLV files directly into your project." "How can I play .flv videos from YouTube on my iPhone 7 Plus? Any suggestions?" Flash Video FLV is typically used by streaming sites like YouTube, VEVO, Hulu, Metacafe and requires Adobe Flash Player version 7 or later to play. FLV files are commonly encoded with the VP6 video codec. iPhone iPad, as well as most of other Android/Microsoft mobile devices, and some video editors etc. do not support FLV video playback. Here we introduce the most popular way to transcode FLV to HEVC/H.265, a new efficient codec natively supported by iPhone X/8, Samsung S7, and other devices. More and more video converters start to support HEVC codec. However, here's the bad news: it can be a lengthy process for many of them to transcode FLV to HEVC, as the new codec HEVC encoding is much more demanding than other video codecs such as H.264. 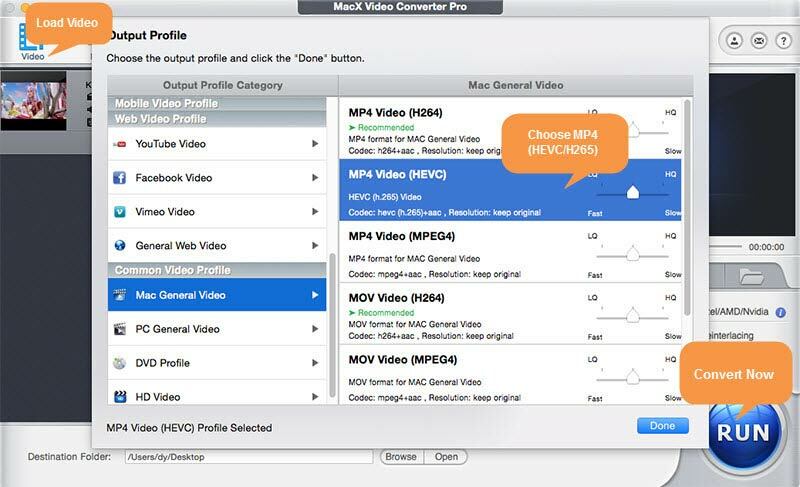 Surprisingly, MacX Video Converter Pro, the first video converter that adds support for HEVC codec, entirely solves the encoding issues facing HEVC and UHD HEVC video. We highly recommend this video converter for the FLV to HEVC conversion task. Check out the key features below. Thanks to its fast HEVC video encoding algorithm, Hyper-threading and hardware acceleration tech, the HEVC video converter can transcode FLV to high efficiency HEVC with the fastest speed and lowest CPU usage. High-Quality Engine is built into the program, promising nearly zero quality loss during the conversion process. Built-in 370+ video audio codecs, it inputs/outputs any format you can tell, like FLV to HEVC, H.265 to H.264, VP9 to VP8, VOB to HEVC, MKV to MP4 etc. It enables you to downscale and upconvert videos, such as 1080p to 4K, 4K to 1080p, 1080p to 720p. There are 400+ preset profiles for Apple, Android, Microsoft etc. devices, including iPhone X, iPhone 8/ 8 Plus, Galaxy S8. Step 1: Add source video. After you run the FLV to HEVC converter on your computer, add the source FLV video file. You can either click the Video icon at the top to select your source video or directly drag and drop one or multiple video files from your computer onto the interface. Batch conversion is supported. We tested that the FLV converter was able to load files quickly, much faster than Handbrake did. Step 2: Set HEVC as output format. Once the video is loaded, you'll see the Output Profile window. On the left side, look at Mac General Video under Output Profile Category tab, click it and select MP4 Video (HEVC) on the popping-up file format list. If you used the output before, you can find the output format listed in the Recently Used Profile. Then click OK to save the change and exit the Output Profile window. Other source FLV files you load afterward for batch conversion will use the HEVC output by default. You can also convert H.264 to H.265, MKV to MP4, H.265 to H.264, FLV to MP4, WMV to MOV etc. Step 3: Click RUN and FLV video files will start to transcode to HEVC. A progress bar will appear, showing rate of progress of the conversion. You can select "Open output folder when conversion completed" or "Shut down computer when conversion completed." The HEVC encoder introduced here can achieve the conversion task with much faster speed than Handbrake and other free online FLV to HEVC converters do. Note that the source video file size and your computer performance can largely influence the time it takes to complete the conversion task. FLV: Adobe Media Player can play FLV files without troubles. Other FLV players for Mac and Windows include VLC Media Player, 5KPlayer, RealPlayer, MPlayer, Media Player Classic, and Winamp. Most iDevice, Android devices and many other mobile phones and tablets cannot natively play FLV files. To play FLV files without format compatibility, you can use FLV video converter or install FLV codec pack. HEVC: HEVC codec is widely supported now. HEVC accepted devices includes iOS 11 based iPhone X/8/8 Plus/7/6s/6 Plus/SE/5s, iPad Pro/Air/Mini 4-2, Samsung Galaxy Note 8/S7/S7 Plus, Huawei P9, Google Pixel/Pixel XL, LG G5, macOS High Sierra computers with the A10 processor and newer, Sony/LG/Samsung/Sharp/TCL etc. UltraHD TVs and more. And many media players add HEVC codec support. The most popular best HEVC players are VLC Media Player, 5KPlayer, and some 4K Blu-ray players. Free download the fastest HEVC video converter to transcode FLV videos to HEVC/H.265 codec with 98% quality reserved. It also provides you with 350+ mobile device profiles to convert FLV to HEVC iPhone iPad Android Microsoft, game console with best HEVC resolution and frame rate default settings. How to Convert AVI to HEVC for iPhone iPad macOS etc.